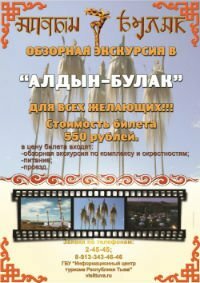 The second day of the Second International Scientific-Practical Conference “Ethnopedagogic heritage of the nations of Siberia and Central Asia”, which started in Tuva on July 9, culminated in the suburbs of Kyzyl by a shamanic kamlanie (ritual), by the healing spring Kundustug (Beavers). The participants of the conference saw the ritual of honoring Fire, performed by shamans of the three shamanic societies, “Dungur”(Drum), “Adig Eeren”(Bear Spirit), and “Tos Deer”(Nine Heavens). A most interesting occurrence was that the heavy rain, which was falling, stopped for the duration of the ritual. Once the ritual was over, it started raining again. The life president of Tuvan shamans, historian-shamanic scholar, author of the book “National Pedagogics”, which has become a rarity, Mongush Kenin-Lopsan considers it significant that the second ethnopedagogics conference after Altai is being held in Tuva, the cradle of shamanism. Shamans are the first eco-pedagogues, the first physicians, the first musicians. The savant is worried that many of the good traditions of old Tuva – love of children, respect to elders, protective attitude towards Nature, are today being forgotten. The largest delegation of guests came from Khakassia. As Nadezhda Tolmacheva, director of the center of national poly-cultural education (Khakass institute for advanced qualifications), many ideas are generated during meetings like this. “A multitude of new ideas is born from what we hear and see here. But we have to write it down, to “capture” the ideas. Otherwise the next idea shows up in a minute, and the earlier one is forgotten,- says the pedagogue. – I was very inspired by the experience of Yakutia in ethnopedagogics, a complete holistic system of upbringing based on Olonkho. We do many of these things in ethnopedagogics to one extent or another, but we can only be a bit envious in a good way, and take it as an example to follow”. Sakha – Yakutia is also represented on the ethnopedagogic forum in Tuva. Yakutia is preparing to host the next conference. “Tuva is a good example of preservation of traditions. We are trying to re-establish the traditions, we collect them grain by grain, putting them together. And you live them,- says Nina Filippova, the head of the scientific workers of the laboratory of socio-cultural problems of education of the federal state scientific institute “Science and Research Institute of National Schools of Republic Sakha (Yakutia). The participants of the forum had ecologically clean traditional food of Tuvan nomads this evening. The national cuisine was introduced by the Khondergei school, of the native land of singers and shamans (Mongush Kenin-Lopsan was born in this area). White (milk) and black (meat) dishes were served. In the following days, the participants of the conference will go on field research tours in Tes-Khem and Tandy kozhuuns. 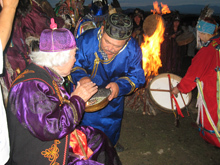 In the village of Shambalyg, a ritual of honoring the Tuvan Shambala (native land Shambalyg) will be held, for which occasion the participants of the conference will ascend the hill Soyan-Nur.